For more information about this Proven Safety Countermeasure, visit the Office of Safety's Roadway Departure Clear Zones web page. Roadside design improvement at curves is a strategy encompassing several treatments that target the high-risk roadside environment along the outside of horizontal curves. These treatments prevent roadway departure fatalities by giving vehicles the opportunity to recover safely and by reducing crash severity. 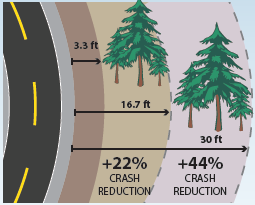 Roadside design improvements can be implemented alone or in combination and are particularly recommended at horizontal curves–where data indicates a higher-risk for roadway departure fatalities–and where cost effectiveness can be maximized. 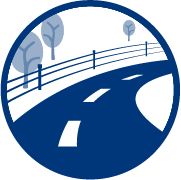 In cases where a vehicle leaves the roadway, strategic roadside design elements, including clear zone addition or widening, slope flattening, and shoulder addition or widening, can provide drivers with an opportunity to regain control and re-enter the roadway. A clear zone is an unobstructed, traversable area beyond the edge of the through traveled way for the recovery of errant vehicles. Clear zones are free of rigid fixed objects such as trees and utility cabinets or poles. AASHTO's Roadside Design Guide details the clear zone width adjustment factors to be applied at horizontal curves. Slope flattening reduces the steepness of the sideslope to increase drivers' ability to keep the vehicle stable, regain control of the vehicle, and avoid obstacles. Adding or widening shoulders gives drivers more recovery area to regain control in the event of a roadway departure. Cable barrier is a flexible barrier made from wire rope supported between frangible posts. Guardrail is a semi-rigid barrier, usually either a steel box beam or W-beam. These deflect less than flexible barriers, so they can be located closer to objects where space is limited. Concrete barrier is a rigid barrier that does not deflect. These are typically reserved for use on divided roadways.